The Legends now officially on the Time Bureau's payroll thanks to Ava, but Hank Heywood is concerned about the expenses the elite team is racking up in their efforts to contain the Magical Fugitive menace. To that end, Hank comes along on a mission to 1920's Paris to audit the team and see if all six fully-active Legends are truly necessary for the team to function. Meanwhile, newbie Fugitive Wrangler Mona and Ava wind up stuck in a cell together after Mona's efforts to aid Ray in his bid to romance Nora Darhk go awry. 1920s culture and the legends of the Minotaur. Why are The Legends incurring expenses for The Time Bureau? Don't the replicators on The Waverider let them create any food or clothes they need? Presuming they need resources to keep Gideon running, but how was Rip paying for that in the past? For that matter, how can The Time Bureau have financial troubles? Aren't their all sorts of tricksy things they could do to make money involving time travel, banks and interest? Or replicating rare items like gold and diamonds for fast pawning? The episode's title is a play upon Tender Is The Night - a novel by F. Scott Fitzgerald. which is, like the episode, set in France in the 1920s. At one point, John says that a lute is a dangerous weapon in the right hands and makes mention of the musician Sting. In the original comics, John Constantine's physical appearance was modeled on Sting, who is reportedly also a practitioner of Tantric magic - the same school John Constantine first practiced. Each cell in the new Time Bureau containment facility is encoded with the captive's genetic signature. This allows Mona to pass them their meals without fear of them getting through the force-field to attack her. Gideon is a quantum-enhanced, artificial-intelligence capable of complete autonomous operation. John is able to fabricate the musk of a female minotaur. Minotaurs have amazing powers for tracking prey by scent. The Minotaur of Greek myth was lulled to sleep by a special lute built by Daedalus. Hank Heywood: (To Ava) If I didn't know any better I'd say that you were in bed with The Legends. Either that or this Captain Sara Lance is simply screwing you. Ray: (running into the room) - need a crew of six? I can explain. Nate: He means five. You mean five? Ray: (remembering he can't talking about Charlie, speaking a bit too quickly) I mean five, I mean five. I must have been thinking about Gideon as a real person. Gideon: Are you trying to hurt my feelings, Dr. Palmer? Ray: Charlie here is a shape-shifter. Except she can no longer shape-shift. It's actually a pretty crazy story. Nate: Wait, let me guess. She turned into Amaya, conned you into not sending her to Hell and Constantine put a spell on her and now she's stuck like this? Sara: That is... really accurate, yeah. Ray: I guess that's not such a crazy story. Nate: Pardon moi. You said you saw a monstrous man? Can you explain? Salvador Dali: Of course. Um - thee was a logarithmic curve to his form, the drama of his movement expressing deep, personal cosmogony. Nate: Can you draw me a picture? Charlie: Complete and bloody rubbish, wasn't it? John: Now, just remember The Yanks - they don't say rubbish. They'd say (shifting to a passable American accent.) "That was absolute garbage. I'm an American. Soccer. Yardsticks. Ranch dressing. Weasel." Sara: (sarcastically) Yeah, just a little drunk hunting with Hemingway. What could go wrong?! Ernest Hemingway: I'll never surrender... but I will strategically retreat! Mona: This is my dream job! It's my mom who wants me to be a lawyer. Nora: No. You can't give in to what your parents want. That's what I did and... look how that ended. Ava: (laughs) Okay - you're not going to take life advice from Nora Darhk, are you? You should listen to your parents. Think about your future. Nora: Oh. easy for you to say. At least you had a future! When I was a kid, my dad convinced me to become a demon vessel. Ava: You think it was easy for me? At least you got to be a kid! Try being a clone from 2213, okay? The only taste of childhood I ever had was almost being killed by a Shtriga at summer camp! Mona: Woah! Okay. I need to hear your entire life stories right now. John: Oy! Are you letting him use our D&D miniatures? Zari: No, I didn't let him touch Cyndra, Lord of the Dark Elves. Ernest Hemingway: I warn you - I will strike a woman! Sara: That's for being on my summer eighth grade reading list. Mona has a number of toys, including a Funko Pop! figure of Rose from Golden Girls. Mona gives Nora Darhk a copy of a romance novel called Uncaged Desire by Rebecca Silver. Sara shows up at Ava's office in a trench coat and lingerie to celebrate Ava's birthday. 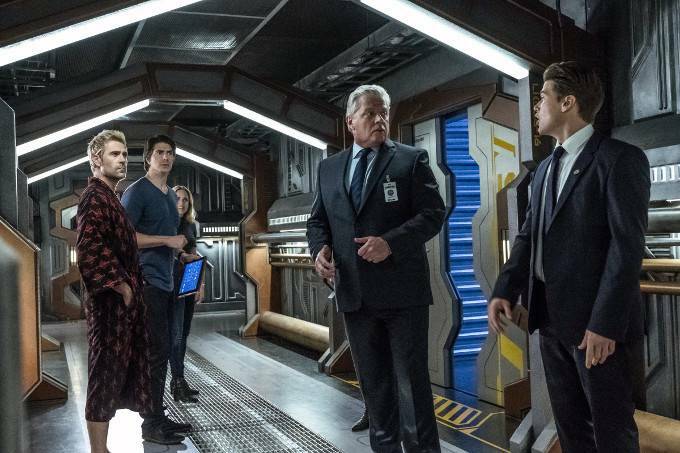 The expense The Legends incurred include $135 million for a new time core for The Waverider (blown up by Rip in 318), $1.7 million for historically accurate costumes and a line item for Assorted Condiments. According to Hank Heywood, The Legends are running a nine-figure deficit. Hank Heywood's official rank is Captain. Hank walks in on John Constantine doing naked tai chi in the library. Nate attempts to hug Charlie thinking she is Amaya. She slugs him. Nate correctly guesses the sequence of events that led to Charlie becoming stuck looking like Amaya in 403. Nate, Sara, Hank and Mick travel to Cafe du Dome and seen Salvador Dali and Ernest Hemingway. Hank Heywood is a huge Ernest Hemingway fan and recruits him to hunt the monster in the Paris catacombs, despite not knowing what they are facing. Salvador Dali saw some kind of monster in the Paris catacombs. Mick makes reference to Commander Steel's death in 214. Ray takes the jump-ship to Time Bureau HQ in 2018 to check up on Nora. Mona agrees to take a love letter to Nora on Ray's behalf. Nate returns to The Waverider to research Dali's sketch of the monster. Charlie and Nate run into Zelda and F. Scott Fitzgerald on the streets of Paris. Charlie recognizes the monster in Salvador Dali's drawing as a Minotaur. According to her, rather than being lost in a maze, the Minotaur hid in the maze after being rejected by his father. Hank sustains a shoulder wound and a broken arm fighting the Minotaur. Mona was accepted to law school at Yale but she really doesn't want to be a lawyer. Ava refers to the events of 404 and her one taste of childhood. Nate has a copy of The Magical Treatises of Solomon in the Waverider library. Mona once met Gillian Anderson at an X-Files meet-and-greet. Some of The Legends have apparently started playing Dungeons and Dragons together between missions. Zari and John are among the players. Their miniatures are kept in the Waverider's parlour. Nate is also a D&D player, but he never played with the rest of the Legends. Nate does not like Tom Clancy novels, televised golf or 70s folk rock. Ava and Nora are both fans of the show "House Hunters." Ray shrunk himself to hide inside his love letter to Nora and got stuck in the envelope glue. Hank plays the guitar and knows James Taylor's Sweet Baby James by heart. Mona's mother's congee is a great hangover cure. Nora asks Mona to take a love letter to Ray for her. Mona calls Nora and Ray the Ross and Rachel of her generation. Ava agrees that the prison could use a little humanity. It is revealed that Mona put a palm tree and tropical flowers in the Kaupe's cell. Nate officially quits The Legends to work for the Time Bureau, but says he'll always be there if they need him. The Legends have a pizza party to celebrate the mission, taking one of Nate's suggestions. He follows this up by suggesting Pinata Fridays, unionizing the team and a softball team. Zari only plays electronic sports. A fair send-off for Nate's character with a lot of clever jokes and silly bits that work surprisingly well. Yet I find myself disappointed that we'll probably never get to see the Legends' D&D night. Here's hoping for a Critical Role style episode sometime soon.